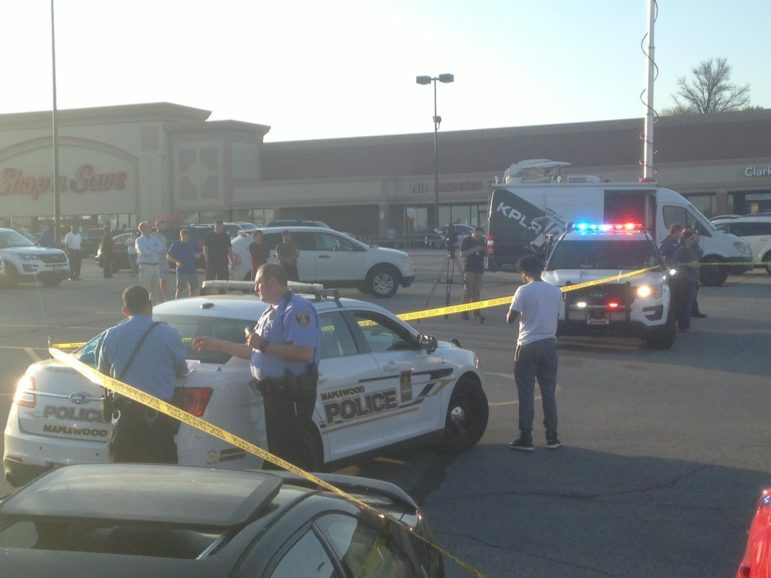 A bystander was hit in the leg by a stray bullet as shots were fired on the Maplewood Shop ‘n Save parking lot near Citizens National Bank Friday at about 6:25 p.m. according to a witness. 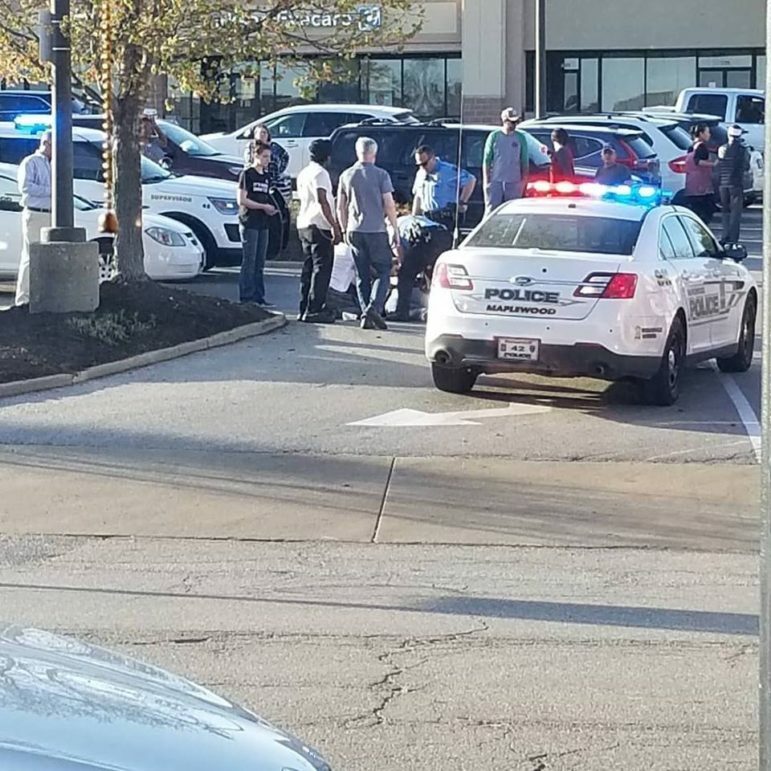 One person has been arrested, Fox 2 reported. A witness who declined to be named said he was four isles over when it happened. He said he was told it started as a fist fight. Residents on Marietta Avenue, a block away, heard the shots. One said he thought it was fireworks. He said he heard six to eight shots in rapid succession. He said he heard sirens five to seven minutes after that. Maplewood Police responding to a woman hit by gunfire. Photo via Facebook. 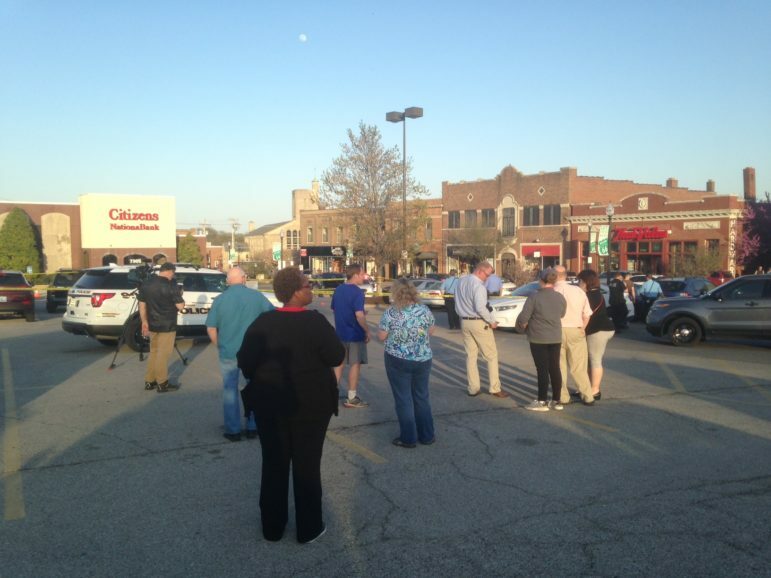 Maplewood police talk to witnesses following the shooting. 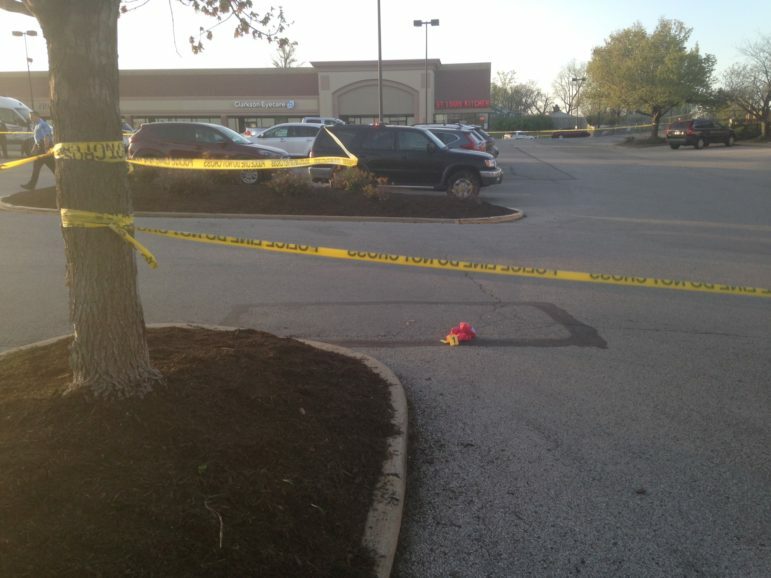 The number #1 marker is where the woman fell after being hit, a witness said. We were stopped at the light at Southwest and Manchester when I heard the shots, and thought, “no way, in Maplewood?” then saw the three running across the lawn south, and two women in the parking lot on the ground. One in the driveway, one next to a car a couple spots west. There were people helping everywhere and looks of total shock. We went to dinner at Muddled Pig and saw there were still police on the scene an hour + later. Maplewood came together to help. This does happen every day, everywhere, for reasons too complex to get into here. But it’s not the neighborhood that sets it off. Doug, please let us know how the injured are healing, if you get an update. Thanks. The “Hood” returns.. this is sad. I wouldn’t jump to that conclusion. This story doesn’t report the facts, it simply reports that something happened. I was there, just 50 feet away and I saw the woman stumble to the ground. One of my friends rushed to help her (along with many others) while I called 911. There was a lot of confusion at the scene before help arrived. The police and EMT’s were amazing and came to the scene within moments. A suspect was apprehended before the scene was cleared. When the facts are available it will provide a clear picture of what happened. Even then, Maplewood is not returning to The Hood over this incident. That is not going to happen! Unfortunately, we live in a day and age where everyone needs to be careful no matter where they are. It is as simple as that. This could have happened anywhere at any time.